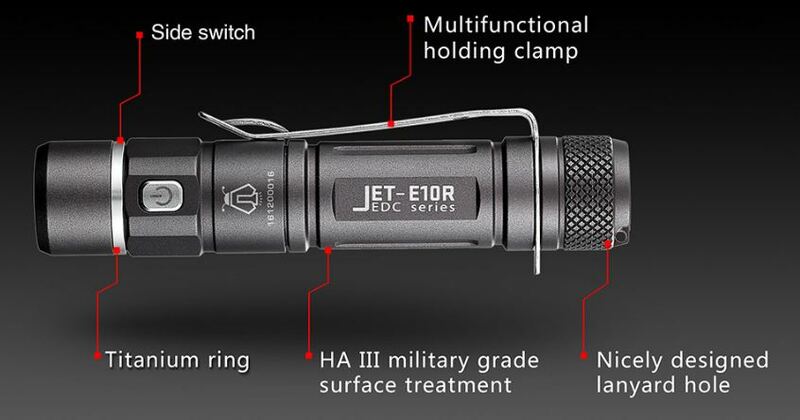 #GB32 - JETBeam E10R XP-L HI 650lm 14500/AA (mi7 killer?) - Winner Announced! Giveaway will be conducted from my site instead. PM me through BLF for group buy information as per normal. Throw Distance: 129 m/423.2 ft. STRICTLY NO Model or Manufacturer or Seller discussion in this thread! Please help to prolong this deal so that more members could enjoy it. Interested depending on price, no PWM, moonlight mode and nice modes separation. Nice looking light, I’m a sucker for these small genuinely pocket sized lights. interested depend on price and tint. Does it charges both ni-mh and 14500 or only charges 14500??? I am a beginner. So please help me to make the channel "grow up"
Beautiful clean design (always liked JBs, love the Jet-I and Jet-II), nice thick pocket-clip, but still befuddled by this fascination with strobes. That’s almost always a deal-killer to me, especially if too easy to trigger (double-click, press’n‘hold, etc.). Genesis 1:3 "And God said, "Let there be light," and there was light." -98 mm length vs 87 for the Mi7. It’s a bit long. -Wondering if the anodized threads allow for physical lockout like the EC-R16? -Does it have tail magnet? right of the people to keep and bear Arms, shall not be infringed. I would probably be interested in one. Only 1 cm plus for rechargable microUSB option, is great…not?